Last night’s Checkatrade Trophy match against Crewe Alexandra was eminently more entertaining than it should have been, but a monumental collapse by Rovers somehow resulted in defeat. Given the financial rewards available for good performance in the competition, it was also a costly throwaway from Rovers. Victory would have resulted in £10,000 prize money, even a draw would have netted £5,000. Instead, we ended up with no money and no points. Micky Mellon made a host of changes to his team, with Mark Ellis, Manny Monthe and Cole Stockton the only three starters to keep their places, while Dylan Mottley-Henry and Zoumana Bakayogo were both given starts after their sub appearances at Northampton on Saturday. There was a welcome return for Adam Buxton at right back, while Harvey Gilmour, Larnell Cole, Jay Harris and Paul Mullin all came in for starts, as did on loan goalkeeper Shamal George. A lengthy stoppage for a clash of heads led to a large amount of stoppage time at the end of the half, and it proved to be decisive. 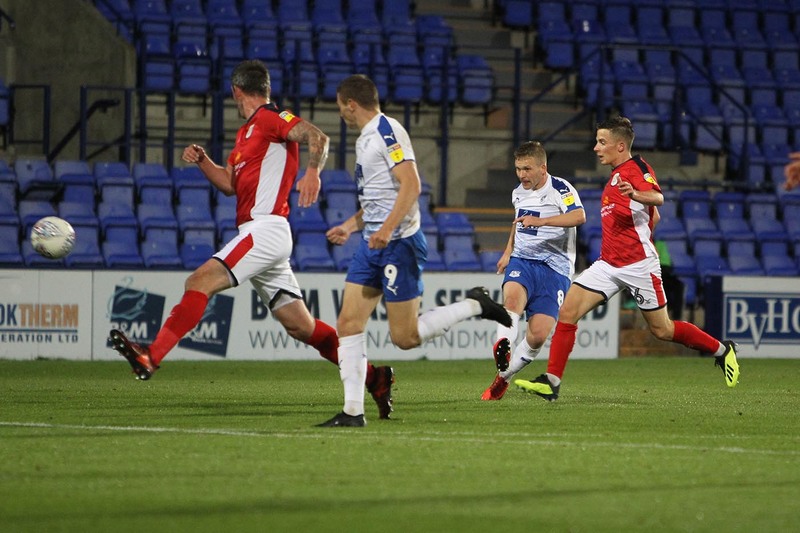 First, Jay Harris unleashed a thunderous effort from distance that fizzed in to the top corner to get Tranmere on level terms. Upon scoring, Harris showed no emotion, instead turning and running immediately back to position for kick-off. It felt like somewhat of an apology for that costly sending off at Swindon a couple of weeks ago. Within minutes, Tranmere led. Mullin – who had been a nuisance throughout the first half – saw a curling shot from distance parried, and Stockton pounced to smash the ball in to the roof of the net from close range. Rovers led 2-1 at the break. There was only about a minute on the clock in the second half when Mullin joined Stockton in netting his first of the season. Horrendous defensive play from Crewe let Mullin run past a group of puzzled defenders, each of whom were waiting for the other to take control. Mullin rounded the keeper and slotted home from a tight angle. For the next 20 minutes, Rovers were dominant. They looked miles better than Crewe as they finally upped the tempo. Mottley-Henry, Cole and later Ben Tollitt once introduced were tormenting them in wide areas. Gilmour was looking impressive in midfield and Buxton was bombing forward at every opportunity. It looked to be a question of ‘how many?’ Tranmere would score. Alas, Rovers buckled under the merest of pressure. Tranmere were still leading going in to the final minutes. On 84 minutes, a free-kick from the right yet again caused chaos, George rushing out to punch and getting nowhere near it, allowing Porter’s header to loop in to an open net. Prenton Park was in shock, and within a minute that man Porter had a hat-trick, sweeping home past George after a left-wing cut back. Again, the goalkeeper less than convincing. So Rovers have it all to do if they are to progress out of the group stage. Shrewsbury away and Manchester City U21 at home still to come.